Here at Memphis Made Brewing, we're always looking to shake things up while we grow. To that end, we've released another one of our year-round beers in 12 ounce cans while updating the look of our first regularly-canned offering. 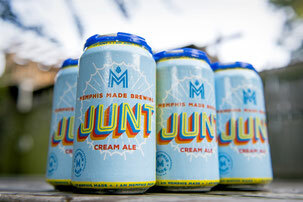 We've started canning Junt, our delicately-hopped cream ale, and cases of this easy-drinking brew are being delivered throughout Shelby County as we speak. Or as you read this, rather. Memphis Made designer Weston Notestine also tweaked the look of Fireside, our amber ale first released in cans in late 2017. The reason we changed the look of one our more popular beers is that we're always trying to better ourselves and our products. For example, we realized that simply changing the color scheme of the can would make it more visible on store shelves. This makes it easier for you to find the beer to drink it, which is a win-win for all involved. Our canning line has also been busy with a whole bunch of other limited-run offerings recently, including Loving Local Pineapple Wheat, Gonerfest Session IPA, Gonerbrau (16 ounce cans), and a lime-infused Junt for WEVL's 30th Blues on the Bluff. We also had commemorative cans for Memphis Music Export's showcase at the Americana Fest in Nashville and for the launch of the Daily Memphian. Expect to see even more types of canned beers from us before the year is out. Stay tuned to see what we can do next.